Oh Mary conceived without sin, pray for us who have recourse to you. Amen. left Geneva on 27 November, the day of “Our Lady of the Miraculous Medal”, to begin this second pilgrimage to the Kumano Way. I had a stopover at Amsterdam, and before reaching the airport I saw some rainbows in the sky. I say some because first I saw two small ones and then a beautiful full one with another on the outside rim – double rainbows! I thought this was a good omen for this journey. In Amsterdam I was to meet Orietta Prendin, who was coming in from Venice, and Stella Pelissari coming in from Paris. Orietta owns a hostel in Viloria de Rioja on the Way to Santiago (she also represents the Jacobean Cultural “Paso a Paso” (Step by Step) Association, and came to accompany and help me with all the work. She participated in my Pilgrim Path process and knew the best ways to photograph, film, help me to dig up the paintings, clean them, put them on their frames and set up the exhibit – really a lot of work to be done in nine days! Stella is a Brazilian journalist who lives in Paris. A few days earlier, I had gone to Paris for the exhibition at the Grand Palais, and on that same day I was interviewed by her for a Brazilian magazine called Versatille. In the middle of the interview I told her that I was going to Japan and she said that her dream was to visit that country. I said “So why don’t you come?” It’s precisely from initiatives of this sort that great encounters and moments are born. This time we arrived in Japan through a different door, Osaka. Brad was waiting for us at the airport and we went straight to Tanabe. That night we had dinner with Yasuyuki Urano, Head of the Tanabe City Tourism Bureau to promote the Kumano Way, Brad Towler, International Director of Tourism and Development in the same Bureau, his fiancée Miro, and Noriko Furukubo, assistant to Yasuyuki Urano. Before we reached Tanabe, we passed through Wakayama to buy the material needed to fix and interrupt the interference of Nature in the paintings. Japan is really unique, very feminine and delicate. I also did some shopping here! We began our great pilgrimage to the places where I had left the paintings more than nine months before. The first was beside the Nakahechi Art Museum in Bijutsu-Kan. I had left three paintings there: Hibiscuses, Three Blue flowers and Path. I was very upset when I saw that the first painting I removed – Hibiscuses – was practically destroyed, but I did not become disheartened and kept smiling. Later on I learned that this spot was previously a rice paddy, which explains why it is so humid. The other two paintings were retrieved, but one of them (Three Blue Flowers) was reduced to just a small piece of canvas. Afterwards I met the museum director, who had been the “guardian” of these first works, and gave her my book “The Pilgrim’s Way“. Then we went to the Bocu Café, the biological restaurant where my paintings were buried in the vegetable garden. The painting called Sunflower was beautiful, so were Bocu I and Bocu II, and Blue Flowers with Leaf was just perfect, waiting to greet me with the magic touch of Nature. This time I did not have to force a smile. When the work was over, we had lunch at the Bocu Café, a marvelous meal that they know how to make only in Japan! We went on to Miharashidai, passing through a forest of enormous trees and climbing to the top of the mountain from where we could see the largest Portal in the world, Oyunohara in the city of Hongu. I had left three paintings there: two Ideograms and Hydrangea. And from there to Yamabushi Mountain, the fourth place to retrieve the canvases. There I had buried Fire, The Mountain, Blue Flowers and Dahlia, which was given as an offering to the temple at Hongu. And now came the hardest part: recuperating and framing the canvases. `This work called for a great deal of patience, because the drying did not depend on me. We were installed in a large room in the old building of the Hongu town hall, where we gathered at an enormous table to start the whole process. As usual, I thought: “I’m not going to do this anymore, digging up and having an exhibit at the same time is so tiresome! You don’t know how it’s going to turn out and the risk is too great. Just imagine if the paintings can’t be recovered – or if they don’t dry on time”. A million things ran through my mind. But in Japan they have a time for everything, whereas we Brazilians would go without eating, working all through the night and getting all stressed out. Not there, things are very different there. We would wake up early, work until lunch time, go out to eat and then come back to work some more until seven in the evening, take a small break for tea and traditional sweets – sheer delights, besides being a treat for the eyes! After that, Stella and I would go for our favorite program: Japanese baths. What a delight!!! Every day the temperature of the water was very high, because these are volcanic waters. The temperature was very pleasant every day, and even though it was late Fall there was still a lot of sunshine. The kindness of the Japanese, and their culture, make the country quite a unique experience. When all the paintings were framed and all that was left to finish the work was to take the photographs in high resolution; here the Japanese gave us another show of their professionalism. They set up a studio the likes of which I had never seen before. We had to photograph the paintings from above; after considering the idea of using a ladder, we rented scaffolding to guarantee the best possible result. Now all we had left to do was to assemble the exhibition. The rest was ready: the paintings were framed and duly photographed, and the digital picture frames describing the working process were already functioning. We had a free day, and it rained. But this was no problem, because in this way we could see the landscape differently and listen to the stories that Brad told us. Before I went to Japan I had a dream, I dreamed about the little one – a child. I was with Paula, my niece, and she showed me the little one. He was a child standing between two young boys; I immediately thought of Saints Cosme and Damian – and their brother Doum too. It was a very powerful dream. When each part of the work was finished, Brad told me that since I had placed my work in the earth and then the earth had returned it to me, I should make an offering in the temple. I remembered that on my first trip to Japan to bury my paintings I had seen a child god and in this same place there was a small temple where people left sweets, toys, candies – everything that children like. I thought of making my donation in this temple. I told Brad this and he informed me that this temple belonged to the other city, not to Hongu. And the offering should be made to the God of Kumano, Hongu Taisha, in the temple where the pilgrims reach the end of their travels. While we were on this tour on that rainy day, Brad began to talk about a monk who had dreamed about 99 children, an experience that left him enlightened. And every time he dreamed about children, the dream was linked to this place of pilgrimage and to this God. So, everything fitted together! On that same day we went to a place on the Kumano Way that was the equivalent of the Monte do Gozo on the Santiago Way (the Mount of Joy is where pilgrims get their first view of the towers of the Cathedral of Santiago, then they relax and rejoice, which explains the name). From this site along the Kumano Way the Portal of Hongu, Oyunohara, can be seen. Brad also told the story of a pilgrim who was having her period (explaining that long ago in Japan women were considered impure during menstruation) and so she was not allowed to enter the Kumano Taisha in Hongu. On that same night she had a dream about the divinity of Kumano. In that place there was an Oji, the small local God: in the Shinto tradition, the Oji are pieces of the larger God, as if they were His children. Dispersed along the whole length of the Kumano Way, they protect the pilgrims and are usually represented by stones. But even today there are temples in Japan that women are not allowed to enter. The ceremony was very beautiful, I began by washing my hands to cleanse myself, then I donned a white kimono and we entered the temple of offerings. Brad did the translating. It was all very moving and magical. First I went through a purification ritual which was done with a long mobile made of white paper – or at least that is what it looked like to me. Sounds reached me through the paper walls, they seemed like chimes and clapping carrying me to another dimension. When I came out of the temple I wrote a card to Paulo, because he was the first person I wanted to share this magic experience with. There is a mail box there with a bird, the symbol of Kumano. Its three feet represent Heaven, Man and the Earth. And this mail box is also the symbol of the union of Men and Peoples – all very profound. Afterwards we had tea with the monk who led the ceremony and we received some gifts, which is a Japanese tradition. The monk, whose name was Ietaka Kuki, was very enlightened. These were nine days of hard work for both the body and the soul. I came back exhausted and deeply satisfied. I do hope that other opportunities will appear to return to this marvelous place called Japan. The Kumano Way extends over a sacred land that shelters Taoist and Buddhist temples, many portals and several legends; it is a pilgrimage route similar to the Saint James Way. There, nature is sacred – it imposes its rhythm. On the grounds that I left more than a hundred paintings along 800 km of the Camino de Santiago during two years, the tourism department of Santiago de Compostela, in Spain, and the city hall of Tanabe, in Japan, also invited me to bury my canvases along the Kumano Way. I learned later that it is a tradition of the monks of the Yamabushi Mountains to bury their sutras and sacred objects in these highlands, which are now on the Unesco World Heritage List. My work was accepted with great modesty and respect. The Kumano Way and the Camino de Santiago are considered to be “brothers,” for their likeness. I took 15 canvases with me, eight of them were already finished, inspired in old paintings by the Japanese artist Ito Jakuchu (1716 – 1800). I worked on the very locations the canvases would be “planted,” using natural and vegetal pigments. In addition, I inserted many ideograms I came to know along the trip. I went to an exposition in Paris and I fell in love with the work of the painter Ito Jakuchu. He not only portrayed nature in its exuberance, but he also revealed its abrasion done by time, reasons that resemble my work. As I received the invitation, I thought it to be the ideal moment to honor Jakuchu. It was a great pleasure to finish this activity. It was so intense, that I felt graced on my return from Japan. The criterion to select the locations was to choose them according to their historical importance or for their proximity to an important spot. The canvases were buried in Boku, Miharashidai, Bijutsu Kan and in the mountains of Yamabushi. But I also felt and followed a very strong intuition. A Shinto monk gave me a mirror and told me that every time I looked at my self, I would be seeing my heart. At the Shinto temples there are no images at the altars. In one of them there is a window through which we can see a grandiose and sacred waterfall. An example: I left some canvases at a vegetable garden, next to an organic restaurant – which food, as it happens, was delicious and prepared by two young women who were the ones who kept the vegetable garden. I chose the exact location in which the radishes would be planted. I thought they would transmit the energy of my work to the food that nourished the local regular customers as it was being prepared. There I placed four paintings: one of a sunflower, another one with hydrangeas and worked the following ones with some pigments and local vegetation. This place was called Boku. I saw a quite interesting ritual in the city of Hongu. Some men came down a steep mountain during the night, carrying torches written with the names of their families and the profession of each one of them. At the end of the course they come out as real heroes, even though some of them are hurt. This is a rite of passage in which men show their courage. And the effect of the fire on the dark, the white clothes and the torches, which make a different sound as they collide, is very beautiful. Normally there is a lot of sake drinking before they descend the mountain. It is always a surprise. I never know the result of the canvases, only at the moment they are unburied. This always produces a great emotion in me. For it is not just about the physical aspect of what a canvas becomes, but about all the energy that comes from the pilgrims and the location. In Japan, I was welcomed with great modesty and respect, as in the region there are the monks, who, like me, bury their sutras. The most fascinating side in this trip – besides nature’s harmony and the architecture of the temples – was the people. To name just a few: the two farmer women that planted and prepared the food; the monks, who always generously offered me gifts, such as the mirror. Another Buddhist temple, also near the waterfall, had a little altar with the image of a man and a baby crawling: this really fascinated me, as the print had a sublime aspect. I entered this temple and saw that there were many toys, candies and sweetis to be given as offerings to the spirits of the children. A very elderly monk approached me and tried to dialogue with me through gifts: first he gave me an envelope and then, smiling, he gave me a box. As I opened the box, I saw that it contained a drawing representing the Chinese year of the ox, and it had a little bundle of candies made of brown sugar, as those given to the children. The artisans seemed like Manga characters and resembled angels. In addition to all of that, in a little store in the mountains, I saw a bracelet with three symbols: a virgin, a ball and a key – the very same ones I found earlier, in the streets of Geneva, a little while before my trip. As I looked at the Japanese bracelet made of braided leather with these three allegories, I felt the impulse to buy it, but at the same time I saw a couple approaching me. As I said I wanted to purchase the armlet, they said they were the artisans who made the objects sold at the shop, and they were very touched that I liked their work so much. So they gave me some fruits made of cotton flowers, as delicate as themselves. I felt they were spiritual and benevolent beings as angels. Mr. Urano – and his entire team at the tourism office – also showed matchless kindness, introducing me to the typical foods of each region and the ryokans (typical Japanese inns) that offered warm volcano water baths. I found the smoke that rises from the rivers of transparent waters especially curious. At the airport I had a pleasing surprise, for they brought me treats: a beautiful silk belt, used to tie the kimonos and green tea with rice grains. The same happened when I visited the mayor of Tanabe – he gave me a fan and a bottle of sake. In Japan, people are very polite; one of their traditions is offering gifts. The great day of unearthing the Camino de Santiago paintings has arrived, at the patio of the University of Geography and History. Elias Torres Feijo – Conrector of Culture, Carlos Calhom (the Via Galego Foundation’s President) and me at the Monte do Gozo and in Villafranca del Bierzo. The work that I had set out to do, has been accomplished. It was with great excitement that I did all this and I want to thank everyone who helped me realizing this work. There were so many people that I’m afraid I may forget someone when I’d mention names. I’d like to thank St. James, who gave us the inspiration. More than two years of travelings along the Camino de Santiago have passed. I thank the Virgin Mary for her protection. I have experienced magical moments there, of communion with the nature, of distress when we encountered problems (like transporting a painting that didn’t fit in any car or van or interview where I would have to elaborate on the purpose of my work or when time was too short to do everything that I wanted to do). But I always had friendly hands to help me. This path never ends, it is the starting point of many paintings that will be spread all over the world. My arrival in Santiago meant that the pilgrimage of leaving my paintings with nature was done. But in some way i was not completely satisfied, and I knew that the process wasn’t really finished yet. Recalling my 1990’s pilgrimage, and also the other many times I went to the Camino de Santiago together with my husband, i remembered that I had missed a location. Villafranca del Bierzo, the emblematic location of the Church of Santiago, a romantic building from 1186. Its northern gate has four arches with a sculptural decoration called “the Gate of Forgiveness”. Pilgrims that were unable to accomplish the path received the same forgiveness here, as if they had gone through the Glory Portal in Santiago. I also recalled the first time I went there. There was a shelter made out of plastic. I came back there a couple of times and each time I was there I met Jato and his wife Maricarmen. Jato, besides being a character, has powers in his hands. I have seen with my own eyes that he healed people, of of the healed being my mother. I decided that I couldn’t leave without burying one of my paintings there. Since I was going to the Ponferrada exposition, I could take the “heart” that I had left in Villoria de Rioja with my hosts and friends Acácio and Orietta. I put on the kimonos that I would bury in Santiago in honor of the sacred Kumano Path. And so we leave, me, Acacio, Galia, a new friend that I had met the year before in Biarritz, and Juliana, my personal assistant. On 3 October, we were in Puente la Reina to unearth the three pictures that had been in Eunate since May. Then we dug up the copper plate that I had left there also in May, just behind the Hotel El Peregrino at the entrance of Puente la Reina. The passing pilgrims were clearly wondering about what was going on. Then we went to the Ponferrada exposition. We arrived in Villafranca del Bierzo in the late afternoon. 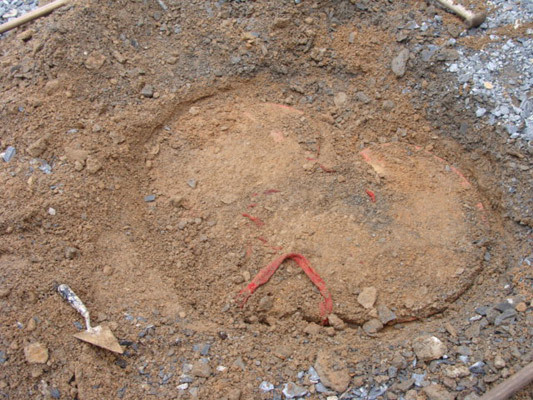 Jato started to look for the best place to bury the “Heart”. He took his magic wand and started to walk slowly. Whenever his wand moved above it would indicate the best place for the burial. He did that in several directions. Jato dug through the stone layer to the finer soil. There, on the water’s veil that came from the altar in the Church of Santiago, I placed my painting with gold pigment. And the grains of soil were put in many layers, from the finer grains to the rocks. The “Heart” was left there. Just before, Marcelo arrived from Santiago and Jato prepared a delicious dinner. A bottle of champagne was opened and we toasted to St. James. On the second day of the St. Moritz Art Masters spectators, journalists, art dealers, PR people and museum directors went up the mountain to attend Christina Oiticica’s performance “Burying of Art”. 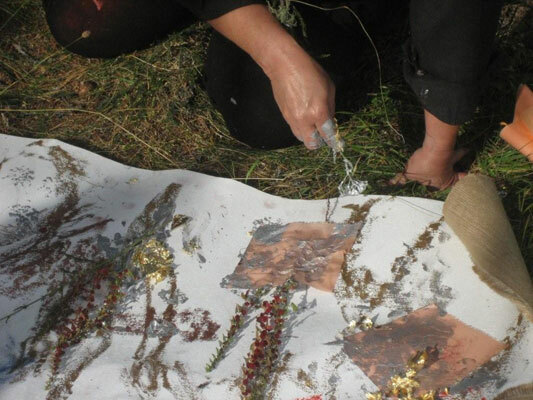 To let nature interfere with her work, she buried some of her own works and she will exhume them again during the 2009 Festival. On the Road to Santiago we stopped at a very special place, a valley that is said to be visited by flying saucers. There also lives an alchemist who works with rocks and their energies. He grinds up the rocks from the region and travels around the world doing this work. People say that beings from outer space taught him this technique. I was very impressed with the beauty of the colors and he gave me some of it. Once I was back home, many people asked me for a little bit of that colored rock dust. There were golden, silvery, pink, red and green dusts. It was a treasure. I was excited that I could use this material to make something beautiful once I’d be in Santiago. On the way, I had been thinking about putting the beautiful mineral powder in boxes so I bought a whole lot of them and left everything neatly stored for the next day when I’d be burying the first frames in Santiago de Compostela. Despite having worked for several days and driven over 1000 kilometers, I couldn’t sleep that night. When I looked at the clock and realized it was already 5 a.m. Suddenly I intuitively realized that the rocks had an energy that was not compatible with me and my work, but only worked for the Alchemist. I opened the door, put the boxes outside and fell asleep immediately after that. I had arrived in Santiago. I couldn’t say that this would be the end of the pilgrimage, because I’d have to let Nature do its work on my paintings and come back to retrieve them. It was at this Cloister that I left one of my canvases and a copper plate. I decided to leave them blank and let past history penetrate them. So many stories have passed through here! It was with great excitement and the blessing of Santiago and the Virgin Mary that I left my work there that morning. Soon after we went to Monte do Gozo. A very important stop on the Camino de Santiago. It is the place where pilgrims from all over the world will have the first glimpse of the Cathedral of Santiago de Compostela. And all will feel a sense of joy. I left a copper plate and 2 canvases there, with the help of Angelo and Edinho. I have always worked with feminine symbols, although in the beginning I did so subconsciously. I have always used the symbols of the nutrition of life, fertility, maternal spirituality and the feminine universe. This can be seen in my exhibitions such as “The Circle and the Dot, The Dot and The Circle”, “Stringing Pearls”, “The House of Time”, “Birth of Venus”, and in many other works that I have developed. When I went to live in the Pyrenees, at first there was no room for a studio, because I lived in a hotel. At that time I had an exhibition in Paris and needed to paint big canvases, so I began to take them into the open fields. One day I noticed that a leaf had fallen on one of the paintings and tinted the paint. I liked that. At that time I had bought a canvas measuring ten meters, and that is when the idea of the “Four Seasons” arose, a canvas that I took out into the woods and developed and elaborated and painted according to the seasons, always covering it with earth, tree branches and stones. At the same time I wanted to expand this project by leaving some paintings in dry river-beds later to be covered by water, others around tree trunks, and so on. Being a pilgrim by nature – in fact I traveled the Road to Santiago in 1990 – I felt that my work had to break out of the four walls of the studio. I formed a partnership with nature, and my work began to reflect its fingerprints. I believe that this is a powerful partnership. Whenever I retrieve my work, no matter where – in the Amazon, in the Pyrenees or on the Road to Santiago – I am always moved by what the invisible hand of nature has done to my original paintings. I think that this is incomparably unique art, for in each and every case the will of water and wind and the mystery of stone and earth interact with my work in a very special way. I often take the painting ready to be placed under the ground, at other times I use materials from the place itself, as with the spring flowers on the Road to Santiago, and the wind and sea at Sète. I do my part of the work and then it returns to the earth, undergoes a period of telluric gestation and is then retrieved. To work with the Earth is to work with the sacred, the Great Mother, the Immaculate Conception. It is like a seed about to be transformed. The final product of all this is very important to me. The Road to Santiago kept ten of my paintings, and the Amazon and the Pyrenees kept one each, but for me it is not just the visual aspect that matters, but rather all the energy surrounding this transformation. On the Road I began to work with metals. I want to use more and more resistant materials. This is just a beginning; we have to wait to be shown the fruits that time will yield. I worked with copper, not by chance, because centuries ago the alchemists used the symbol ♀ – which also represents the planet Venus, the Greek Goddess Aphrodite and the feminine gender – to represent this metal. I dug up the Heart and other paintings left at Cebreiro. I returned to the Way to Santiago on 23 January 2008 to unearth the first, second and third stages. The paintings of the Virgin of the Pyrenees, Roncesvalles, Alto do Perdão, Santo Domingo de la Calçada, Viloria de Rioja, Saint Juan de Orteja, Saint Antan and Castrojerriz. Four months had elapsed when we arrived in Saint Jean Pied-Port. Everything was covered in snow, the road that took us to Roncesvalles had been cleared, but when we looked on either side we could see snow a meter high. Even so, it was impossible to make it to the Virgin of the Pyrenees to dig up the paintings. The climb up is very steep and the very narrow road had been closed. When we reached Roncesvalles we met our hospitable friends Orietta and Acácio. Right then it started to snow again and it grew intensely cold, but it gave me great pleasure to dig up the earth, the mixture of earth and snow, and it was so good to find the paintings! I was a bit frustrated not to be able to remove the paintings of the Virgin of the Pyrenees… where my hand touches the sky. The different moments of interference in the canvases were subtle; I had laid one on top of the other, so those in the middle suffered less interference. When we got to Alto del Perdón, there too the snow made it impossible for us to climb up. I started to panic a little, thinking that I was not going to have any paintings for my exhibition in May. We went back to the Templar Chapel that had impressed us so much the first time. The Virgin of Eunate is seated on the throne with the child Jesus in her lap. This time she held a sprig of wheat in her hand. When we entered the chapel, there was a woman performing a strange dance, gyrating around herself like the Sufis do. With one hand pointing to the sky and the other to the earth … an alliance between the sky and the earth, the meeting of two energies, masculine and feminine, THE NEW ALLIANCE. One day I lay down in a field of wheat in the French Pyrenees, feeling the earth underneath me and looking up at the sky. I had the feeling of perfect communion. When the energy of the sky descends to earth like Jesus, and the energy of the earth rises to the skies, the Great Mother. On that day I felt that this place was open for me to do my work. I fetched a roll of canvas and said to Paula: “I’m going to do a large painting.” I measured the North portal, the entrance to the chapel. A woman appeared, with a soft, sweet expression on her face, and asked what I was doing. “I work with nature, the energy of the ‘Great Mother’. I’m starting a big painting.” She asked if I worked with earth and I said yes. I began making the impression of the stones on the ground, as if they were stamps. Then I went over to the South portal. It was so windy there that I had to hold the canvas down with heavy stones. I discovered the vertical lines on the ground. I went to the East portal, where the altar stands, and then to the West portal. The columns and some stones traced the ground. I carried the big canvas to the land surrounding the chapel and painted with the earth. I placed stones and spread natural pigments and left it there for one night. The next day we were going to fetch the canvas and leave for Madrid and Jerusalem. When we arrived, some cars were parked and we guessed there was going to be a Mass. We entered the church and saw some people holding lit candles. It was the feast of the day of the light that came to the world. We were very moved by this inspired Mass. The lady who had been there the day before was called Mariam. She invited us to have some hot soup; she was a hostess in Saint Mary of Eunate. I called her over to see the result of my work. She is a painter too and uses earth for her textures. This meeting was very special. On the 27th we went to San Anton to fetch a painting that I had left there. It was easy to find, but the same thing happened as with the Santo Domingo canvas. Next we went to Castrojeriz. The wind was so strong it made one hallucinate. I had only ever experienced a wind like that twenty years ago in Ireland, when some ships sank and many people drowned. The Castrojeriz paintings vanished without even a trace, just as in the two previous places. I was petrified, and thought: I’m not going to have any paintings for the exhibit on the 13th of March! On the 30th of January we went to Saint Juan de Orteja. Now the road that was closed earlier was cleared and we could get through. But there the same thing had happened. This time, however, there were traces, but the Road had taken the pictures. And these paintings were precisely the ones that I put in the publicity leaflet, and they no longer exist. In January it was really difficult to recover the paintings at Alto do Perdão and Virgem do Caminho. I would pick them up in March. The next day I decided to go to Viloria de Rioja and do some work for a night in the – now totally destroyed – house where Saint Dominic was born. I also took the canvas that I had wrapped around the tree in Santo Domingo de La Calzada. And I also worked on two other smaller paintings, one in tones of blue and the other in green. For the first time I worked on the Road with fire. I left these pictures there for one night. We stayed several nights in Santo Domingo. On the first night it continued to snow so heavily that the next day Orietta and Acácio were marooned in their village. We went down to where I had left the long canvas with the story of the Saint in the dry river-bed. We tried to find it, but gave up because the snow kept falling. Then we decided to make a picture with the snow that would fall during the night, so I rolled another canvas around a tree and we stretched the stick to mark the creases, just like we do in a woodcut. This was deep integration between work, snow, cold and nature. The strong energy of that moment made Paula and me feel nothing else besides the effort made by working for three hours in the cold, with the snow falling on top of us. The next day I returned with Acácio to try to retrieve the canvas in the river. It had stopped snowing, and with him it was easy to find the picture. The canvas had a different material from the others that I had used up till then, and although I had worked with several materials, this had never happened before. The whole part of the canvas that I had painted peeled off like bark, leaving only the cloth, and leaving me deeply disappointed. To make up for that, the other paintings that I had left out for the snow to work on, plus the one I had wrapped around the tree, turned out magnificent. We went to Viloria de Rioja, where Acácio and Orietta have a hostel, and where I had also left five paintings. Despite the snow, it was an easy place to dig them up. I feel that my pictures seek energy from the earth, just as we feel when we do cundaline exercises and feel the earth’s energy rising through our feet and hands and passing through our body. The energy of the Great Mother. Today I find myself here again in Cebreiro, 17 years later. I love this place, for it was here that Paulo found his sword. This is where the transubstantiation of bread into flesh and wine into blood took place. I left a heart here, near a stone wall, and the other paintings further ahead. In front of these paintings stands a wall with two letters and a book between the stones. I also left another eight paintings buried, worked with leaves and shells, and another three inside a bush, untouched, because it rains and snows here, so I want to see how this will interfere with the blank canvases. Yesterday I was in León and made arrangements for four exhibitions: one there, another in Astorga, then Ponferrada and Bembibre. On 29 November I was in Puente la Reina, where I unearthed the painting I had done in a field of sunflowers. And I also left six more with flowers and shells, which I plan to dig up in May. Tomorrow, God willing, I reach Santiago. I traveled along the Camino to dig up the paintings I had left there, at Páramos in Calzadilla de la Cueza and Hospital de Orbigo. This turned out to be a great surprise, for they were as happy as springtime. As I always do, I went to Velloria de Rioja to visit my friend Acácio. This time he came with his sister, Maria Fernanda, who was following the Camino in stages. Orietta had to stay behind because of the many pilgrims at this time of the year. There was a Korean in the hostel who started to cry when she saw me. She had read all of Paulo’s books. She was very moved and gave me a present. In Calzadilla we met Cesar, who once more helped us to dig up the paintings. Then we went on to Hospital de Orbigo to meet Emilio, a journalist for the Diário de Leon, which published an excellent piece by him on 25 July, Santiago’s day. He had come to meet me when I came to bury the paintings, and now again at the moment of digging them up. I showed him the diary and some paintings of Páramo and Calzadilla that I had framed. We went along to dig up the paintings at Hospital de Orbigo. They were so beautiful! Pedro was not there, but his family appeared for the event. The next day we went on to Puente la Reina to set up the exhibit at the El Peregrino Hotel and do the piece for ELLE magazine with Gema Veiga and the photographer Conrad White. We chatted over dinner after spending the whole day setting up the exhibit. Like an herbalist, I placed several paintings together to form panels. And the next day we went out to take the photographs, and of course I had no idea what I was going to create. There was a canvas I had bought in Pamplona, I was worried because I did not know and was not familiar with that material. I had already had some problems with the canvas I had taken to Santo Domingo, San Juan de Ortega and Castrojerriz, but I had to work and demonstrate how assured I was, because I was with a journalist and a photographer whom I did not know. I began to press the canvas against the stones of that famous, beautiful bridge. The tubes of watercolour that I was using were new and it was difficult to achieve the effect that I was after. I thought of taking the canvas down to the river, but I spotted a pilgrim and wanted him to walk on top of the canvas. So I waited for him to arrive and make my request. I went down, dipped the canvas in the river and it took on a totally different texture, went soft and flexible, and the marks of the tubes were diluted. I went to the field of sunflowers and started working with the texture of the center of the flower, like a stamp, and buried it near El Peregrino. This exhibit was very beautiful and my old friends were there to help me: Marcelo, Acácio and Orietta. My friend Suzana also came to pick up her painting which had been buried in the gardens of El Peregrino. It was a mouth and heart with the symbol of Mary. I HAVE JUST RECEIVED a telephone call from ENRIQUE at the Gaia cellar in Foncebadón. As soon as he opened his restaurant today he noticed that the paintings were gone. The big stone we had placed on top was no longer there, and the earth had been shifted about. He was very sad when he called and made a hundred apologies, but we know that the Way to Santiago has for many years had its share of SCOUNDRELS (both male and female). Christina, I suggest that you paint something in Foncebadón; meditate and we shall see what we can do. Let’s pray that the soul who took the paintings has no problems. We know the strength of prayer, the strength of the Way, the strength of Foncebadón and Cruz de Ferro … LET US PRAY!!! Well, dear friend, this is sad news indeed, but I am going to meditate to understand the REASON FOR ALL THIS. Even so, we shall go there, for FONCEBADÓN is a living legend that Paulo has premeditated so much about, and so much has still to happen. In five days´ time I will be leaving here for the Camino to gather the springtime harvest.